The Poison Skies - release! 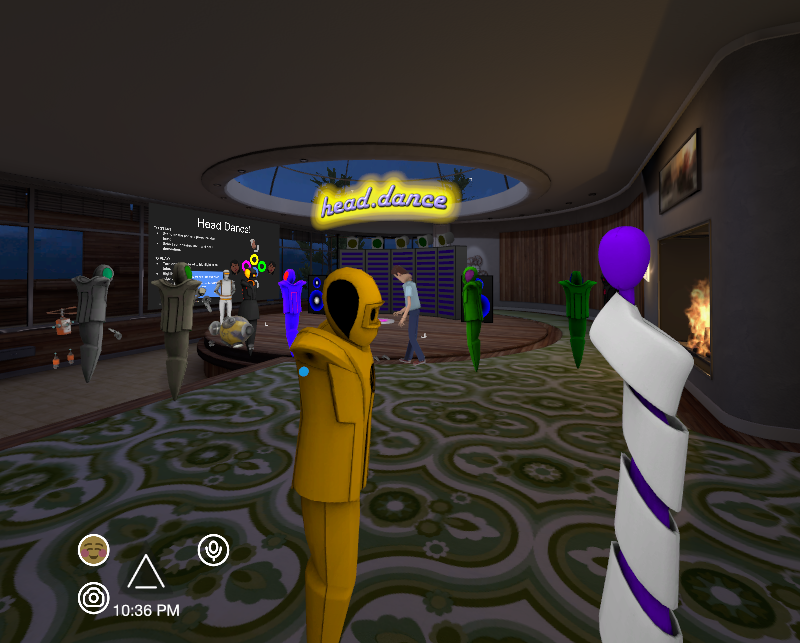 Seeing this appreciation for a game first-hand in such a physical way is something I've never experienced before... it felt like looking at a popular booth at an independent game festival which had brought along a huge complicated rig, except the "hardware" is entirely in software. 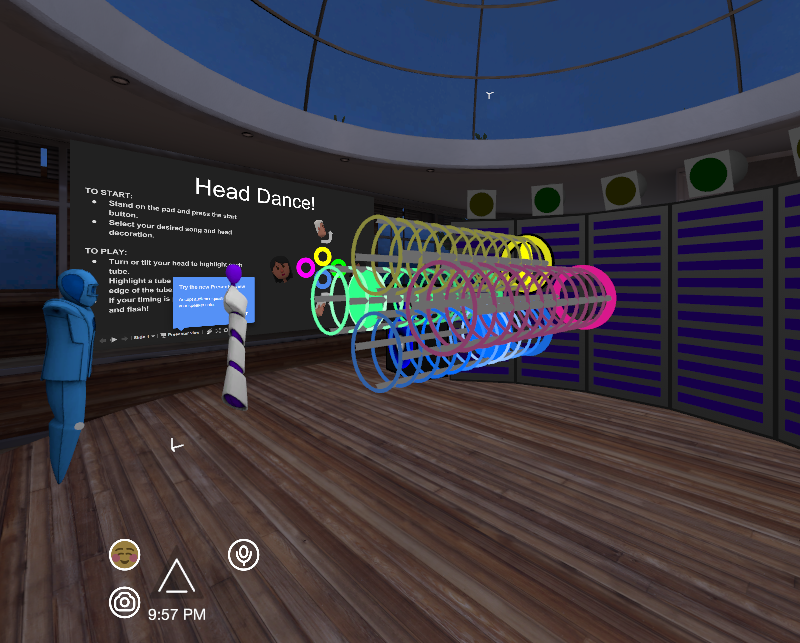 I think hopping into here briefly has seriously boosted my appreciation of the possibilities of VR. This is a preview of something I have been aching to show off for a very long time! "The Poison Skies" is a joint project by me and kjorteo, with artwork by Sparkyopteryx. It's a concept album inspired by the characters and story of Kjorteo's novel "The Afflicted" (and you can read the first chapter of the online edition behind that link). "Stand Our Ground" is the fifteenth(!) track, and is about Jonathan Coral, a character from the story who is determined to keep standing up to the wickedness and madness of the world despite his exile in the wilderness. Over the couple of years since I released any new songs I've been trying to learn more about music production, graduating from my previous Amiga-style sound (and I have to thank ravenworks for giving me so much advice on vocal mixing). After experimenting with my own vocals on The Day the Night Slept, this is my first fully voiced album - and I hope you enjoy the sound as much as I do! You can hear the high-quality version of this track on Bandcamp, along with a selection of previews from the rest of the album! I have just a few more tracks left to record - hopefully the full version will be available soon. I've really got into Sabaton ever since seeing them as an opening act a couple of months ago. Because of their song subject matter, which varies between war, soldiers, warfare, tanks, battles and fighting, I had assumed they would be too violent for me - but they were hilarious on stage, having fun with their tough metal image, and the singer Joakim Broden is incredibly nice despite looking like two bears stuffed into a man-suit. They were so amazing that I came away with their latest album, Heroes, which is about people who did extraordinary things during the second world war - and I spent the entire next day Googling WW2 history because they had made it so interesting. One of the album's singles, Resist and Bite, tells of the time when due to an error in getting orders through to forces, 40 men armed with rifles were essentially left to defend the whole of Belgium - which they did so fiercely that when the Germans eventually defeated them after eighteen days, they demanded to know where the rest of the force they had been fighting were. And Hearts of Iron is for a Walther Wenck, a Nazi general who disobeyed his orders to defend Hitler's bunker in the final days of the war and used his men instead to hold a safe passage out of Berlin to the west, evacuating an estimated quarter of a million citizens. Have you seen that video on Youtube with Hitler shouting furiously in the film "Downfall" and it's subtitled to make it look like he's been banned from XBox Live or something? The actual scene is of him finding out that this was happening and he was definitively losing the war. This one is called Smoking Snakes, which was a title that leapt out at me as particularly strange at first, but it has an amazing story behind it. In Brazilian Portuguese at the time of World War 2, you didn't say "When pigs fly" to say that something is impossible - you would say "When a snake smokes" (as in with a pipe in its mouth). And people would say that Brazil would join the war when a snake smoked - but they eventually did, declaring war in 1942, and their forces were nicknamed after this expression. The subject of the song sounds like pure Metal Gear Solid, but it really happened (except without all the singing robots) - a group of three soldiers from these Cobras Fumantes sabotaged Nazi operations against overwhelming odds before eventually losing their lives. And because of them, the phrase "a snake will smoke" is still in use in Brazil - but now it means "something incredible is about to happen", almost the complete opposite of what it meant before. And I think that's really nice. Nova Genesis (Ad Splendorem Angeli Triumphantis): Choirs split into male and female chanting passages from Psalm 68 and the Apocalypse of St John. Duke Nukem speaks Latin. Il Cigno Nero: Starts off sounding like it's going to be slow-paced but quickly turns fast and choir-supported as well, with high notes from Alessandro Conti singing quite beautifully, but I have no idea what about because it's in Italian. The last passages of this, with heavenly choirs and trumpets, sound like what I'd expect from the final song on any album by a reasonable person. Rosenkreuz (The Rose and the Cross): This was one of the singles released before, so I thought I would be prepared for this, but the choir of the apocalypse is still here and is now joined by a very active string section which gets its own solo. Anahata: The first track not to feature any Latin. But what it does have is a glorious John Williams-styled orchestral beginning that turns into a mid-paced song without quite so many choirs (then again, this isn't saying much) but with an equally pompous horn section. Il Tempo Degli Dei: The booklet quotes Jesus Christ. (Equally applicable: "The booklet quotes. Jesus Christ!") Like Il Cigno Nero, this is entirely in Italian, it's upbeat and wondrous and I have no idea what it's saying. One Ring to Rule them All: Gollum!!! I can't tell if it's the Andy Serkis version from the films or just an impression of it, but it's Gollum and his precioussss. I seriously thought that this song was in Orcish or some other made up language, but it's actually entirely in English (the first track to have this honour) with enough layers on top of it to disguise it as such. It's what you'd expect, seven minutes of being absolutely stunned by the excess of it all. Notturno: I think we're actually calming down a bit here. By this album's standards this is a fairly low-key performance, still full of orchestrations but slower and dare I say it, calmer. Prometheus: No, that was just to make you think you were safe. We've already covered this - the lyrics hide a code that somebody managed to work out a part of, and that's that the pre-chorus lyrics encrypt a binary number that works out as 81, which the explanation tells us is the Perfectum Numerum Quem Noviem Novies Multiplacata Componiunt and invites us to use this as a starting point to decode the rest of the album. You absolute wankers. King Solomon and the 72 Names of God: I seriously think this is in Yiddish or Hebrew or something. Possibly both. I don't even know if I can make intelligent commentary any more. Very technical track. I'll need to listen to this another twelve times before I can even process it. Yggdrassil: There's so... much of everything. I don't know. Chapter III: The Astral ConvergenceL ...wankers. Chapter IV: The Divine Fire of the Archangel: What?! Chapter V: Of Psyche and Archetypes (System Overloaded): I seriously can't do this any more. Thundersteel (Cinematic version): It is a bonus track. Is this the most pretentious song ever written? Look at the lyrics - just look at them. 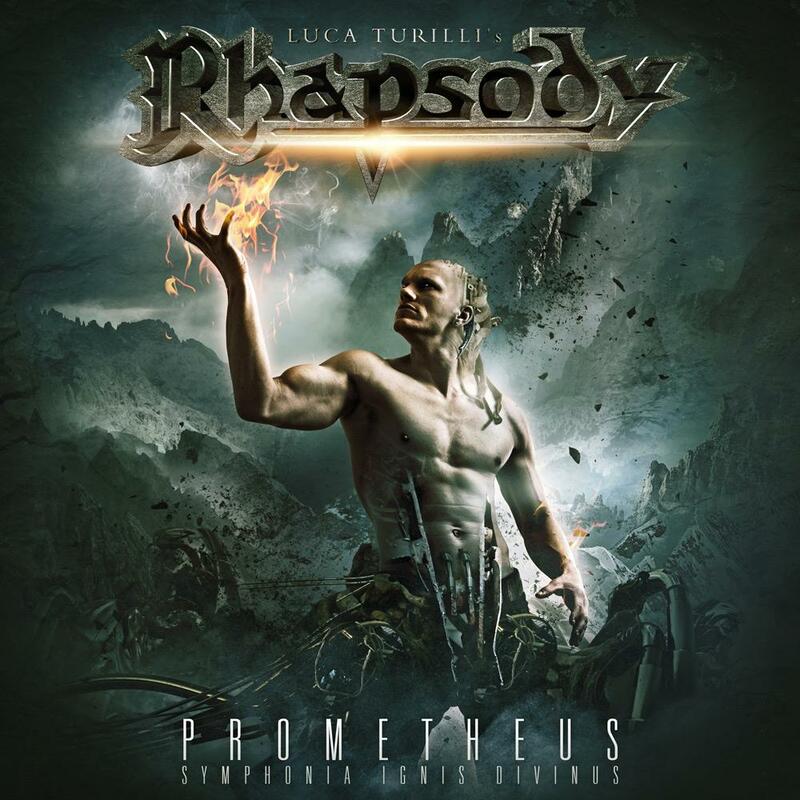 I'm not even sure if they mean anything, they're just as many pompous grandiloquent words as Luca Turilli could plausibly fit together. Two choirs, a full orchestra... but impossibly, he has the compositional ability to justify it! Moa810 joked about Anghel Higure being Luca Turilli... but just like everything else that happened in Hatoful Boyfriend, I think it seriously might be happening. The album was released a couple of days ago... I can't wait for it to arrive! Edit: OH MY GOD. "If you are interested in discovering more about the CODEX NEMESIS, then you should consider the 81, defined by SENECA as the PERFECTUM NUMERUM QUEM NOVIEM NOVIES MULTIPLICATA COMPONIUNT, simply as a starting point for the comprehension of all things" WHAT?! 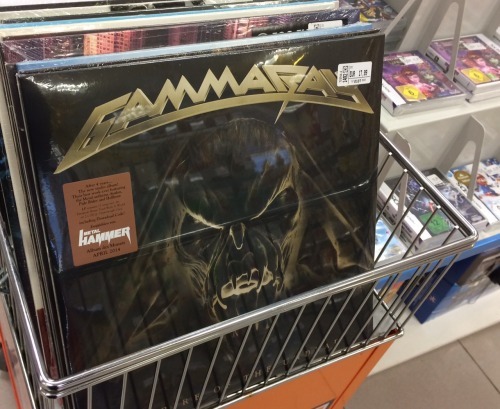 It's like a parallel universe here in Germany, seeing GammaRay's latest release just sitting there at the end of a convenience store's music shelf instead of only being available on import... and on vinyl, as well! I really would have bought it despite not having any means to play it if it had been an album with remotely attractive artwork. It's been too long since I released anything, so here is a preview of the song I've been working on ever since I started playing around with Shreddage again! 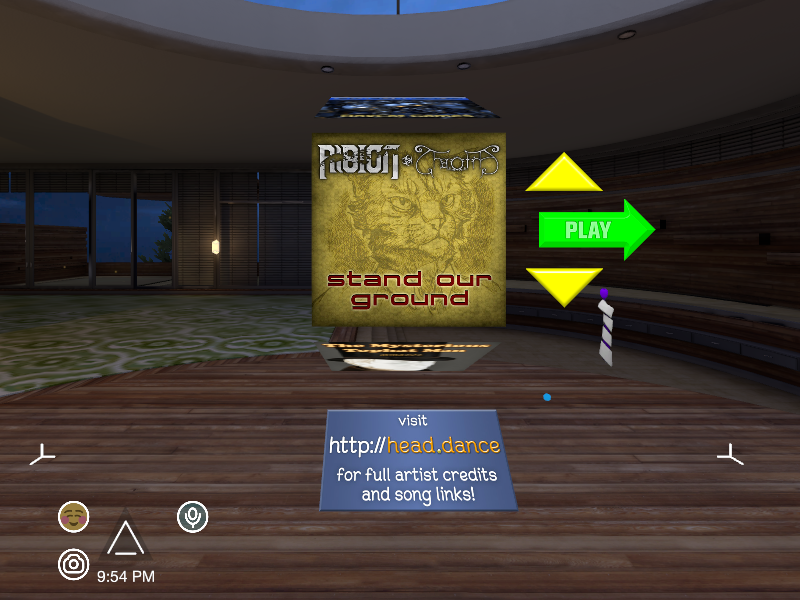 It's basically finished - new guitars, drums, everything - with a couple of rendering errors thrown in. I've been toying with a new version of Shreddage and I'm really pleased with how things are beginning to come together now! Here's a sample of one of my earliest coherent songs redone in it. I had this game when I was young! It's a handheld by Tiger Electronics, branded as Sonic 2 but not actually resembling it in any form. In fact, looking at this video now I have no idea how I was able to tell what the cobblers was going on at any point - I remember having to wind up to the left to get around the suddenly appearing loops, and that jumping would cause a sequence of LCD panels to flip on and off representing going up to the right or the left, but I don't know what details (if any) constituted a game. If you've watched the video, you'll know there's one detail that stands out in particular - the sound, a cacophony of rapid spasming notes that sound like someone just stabbed holes in a sound chip with a hole punch and called it a day. But on a whim, I recorded a bit of it and put it into Audacity to slow it down - and it got interesting! It is, in fact, the 2-player Emerald Hill music! Or a cruel parody of it, anyway. Between a set of bum notes and spread over an interpretation of the rhythm best described as 'creative', three measures of the tune are just about recognizable before it gives up and just goes back to the start again. As it plays about three times too fast in the game and is not sanely describable as any form of music, it's odd that nobody thought fit to correct the error. Surprise! Here's a new song. After the whole Hatoful suite, the sound of the phrase "burn down the lighthouse" really stuck with me, enough to deserve a revisit. The lyrics, of course, have nothing to do with my real life whatsoever. I apologize for the generic background (this is what passes for a dark song for me) - I now know exactly what the theme and title for the album after my next one will be, but I want to wait until it's nearly finished before I reveal it! I took a request for my Big Band autoplayer and fed in a MIDI of the overture for Handel's Messiah. Unfortunately one of the notes was out of Player 2's range, and... things took a turn for the violent. I really like the way that after Big Band 2 just throws his trumpet down and kicks the other in the head, the input for "start playing the trumpet" comes up often enough to make it look like one of them is desperately trying to continue the song - the first player looks like he's earnestly trying to continue the first time only to repeatedly take a trombone to the nuts. I think the accidental fighting AI plays slightly better than I do. I downloaded competitive jiggle-em-up Skullgirls a couple of weeks ago and have been having a lot of fun with it. But being the person that I am, it inspired a coding task. As an aside from the normal character roster, one of the bonus characters (and to date only male fighter in the game) is Big Band, who appears to be an anthropomorphic saxophone, and his signature move is to pull out his trumpet, whereupon your controller turns into a set of valves that you can use to tootle at your opponent. So I chose to spend a couple of evenings writing a little background program to get the anthropomorphic saxophone character Big Band to play MOD music. Here's a brief explanation - it features Ode to Joy and The Day the Night Slept! For Legumentine’s Day 2014, here's something that's been in production for a while - a collection of four songs inspired by Hato Moa’s Hatoful stories, along with vocal and karaoke versions. With the download, you get all twelve DRM-free music files, a PDF of the album booklet and the source .IT files for the songs if you want to poke around in them. Music and lyrics written by accident by David Newton, album artwork used with permission of Moa. King-voice on “Long Live the King” by Kjorteo Kalante. 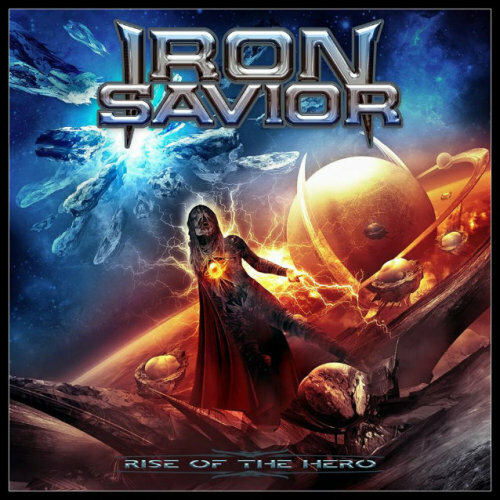 I am continually in awe of how amazing Iron Savior sounds - to consistently come up with songs that feel like this one is what I aspire to! After going on hiatus for a few years in 2006, they really have returned better than ever. This video shows off their new approach to video-making as well, not having been given a budget for it and so just making it themselves out of singing in the car or mucking about in the studio - I love the crack-up at the end, and just in general how these musicians have a sense of humour about the tough metal image! In fact, everyone seems to be suddenly coming back and releasing a new album at the start of this year - Silent Force, Gamma Ray and Sonata Arctica, to name a few. One month to wait until this one! I've developed a bit of a tradition of posting unusual Christmas music on December the 25th, but I was unable to think of any that had really caught my attention this year. Therefore, I’m going to twist one in to suit the theme - this is a recent remake of one of Iron Savior’s best songs ever, Coming Home, and I can’t decide which version I like the best - both of them contain the to-the-letter space film score introduction followed by the bass that sounds like Road Rash on the Megadrive, and naturally the stunning chorus. This is from the second part of the story, with members of an ancient civilization following a star on the way to the Savior’s… birth… place… and… I think this might actually be a Christian allegory which I haven’t noticed for the last ten years. Hmm. The Holidaystar suite closes with a song that's unusual for me - I've finally written a ballad! This is the slowest song I've written... ever, I think. And it took a long time to come together, but in the end I was very satisfied with how it closed the album. So now it's time to make plans for a Bandcamp release!